Carbon–climate feedbacks have the potential to significantly impact the future climate by altering atmospheric CO2 concentrations (Zaehle et al. 2010). We show that simulated carbon–climate feedbacks can significantly impact the onset of undersaturated aragonite conditions in the Southern and Arctic oceans, the suitable habitat for tropical coral and the deepwater saturation states. Under the high-emissions scenarios (RCP8.5 and RCP6), the carbon–climate feedbacks advance the onset of surface water under saturation and the decline in suitable coral reef habitat by a decade or more. The impacts of the carbon–climate feedbacks are most significant for the medium- (RCP4.5) and low-emissions (RCP2.6) scenarios. For the RCP4.5 scenario, by 2100 the carbon–climate feedbacks nearly double the area of surface water undersaturated with respect to aragonite and reduce by 50 % the surface water suitable for coral reefs. For the RCP2.6 scenario, by 2100 the carbon–climate feedbacks reduce the area suitable for coral reefs by 40 % and increase the area of undersaturated surface water by 20 %. 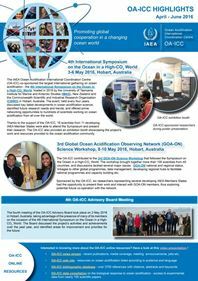 The sensitivity of ocean acidification to the carbon–climate feedbacks in the low to medium emission scenarios is important because recent CO2 emission reduction commitments are trying to transition emissions to such a scenario. Our study highlights the need to better characterise the carbon–climate feedbacks and ensure we do not underestimate the projected ocean acidification. Matear R. J. & Lenton A., 2018. 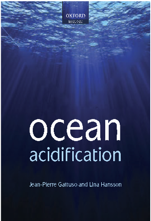 Carbon–climate feedbacks accelerate ocean acidification. Biogeosciences 15 (6): 1721-1732. Article.